The best way to save money is make it yourself! This year we decided to start a garden to save a little on produce. The materials cost us $40 (wood and chicken wire) from Lowe's. It is a 4 foot by 4 foot raised bed garden. See the 4 foot by 8 foot Garden instructions on another post. 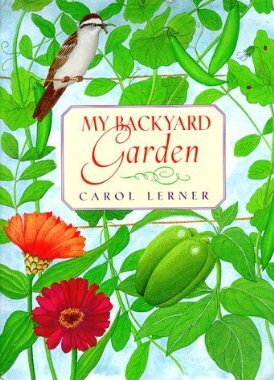 Beginning Gardeners: A great book recommendation to get started with whatever garden you want is My Backyard Garden. I had a Black Thumb before reading this book, but it is written for an elementary school aged kids so even even I could understand it. It is broken down month by month with easy to grow plants. It includes when, where, and how to plant your garden. The colorful pictures of what your seedlings shoudl look like when, and even pictures of common pests for each vegetable are fun to look through with your kids as they help you weed. We decided to do a raised bed due to lots of roots in our yard. also check your local recycling center for free compost to fill the bed. I didn't have the chicken wire at first, then we had a bunny eat most of my seeds. I read you could do up to three feet high if you have jack rabbits,but I think it was a traditional rabbit and I wanted to be able to lean over the wire to weed.We got 24 inch high wire an we have had no repeats of the bunny. 1. Cut each 2x6 in half to give you eight 4 ft. sections. You’ll put two on top of each other to form each side (You could user wider stock and less boards, but the 2x6 are much easier to handle and rip with a table saw). 3. Assemble the box using the 2x2 boards to brace each corner. Use the two 6 ft. 2x2’s to brace the back, and then brace their top with the 4 ft. 2x2. 4. Staple sections of chicken wire up the back to allow grown of vine-growing vegetables. We also wrapped chicken wire loosely around the base to keep out seed-munching varmints. I added some scrap rebar driven into the ground near the front corners to reinforce the wire. It can unwrap to give you access to the garden when needed. Our "watering cans" are recycled milk jugs with holes poked in the top lid.. Since the boys tend to drown plants we made the holes small so that not much water came out at a time. This way the boys can help water but drown my seedlings.